Time to talk about Singapore! We were fortunate enough to not have to do any planning, so we had a great time seeing all the sights and trying the great food! We landed in Singapore early evening, just in time for dinner at Hua Yu Wee. I loved the Salted Fish Fried Rice, Drunken Prawns, Black Pepper Crab, and Chili Crab! The restaurant was very lively, and all the food was delicious. It was really impressive Chinese food! Afterwards, we went on a drive to admire the nighttime scenery, including the beautiful streets of Little India. Day 2 - The day we had 6 meals! We started the day with our first meal, Laksa at Sungei Road Laksa at Gourmet Street. This has got to be the best laksa I have ever had, as it was my first time having the authentic version. It was delicious and very spicy! Our second meal was at Lai Wah Restaurant, where we had Chinese food, such as Roasted Chicken and Venison (deer meat) Fried Hor Fun. The deer was delicious (sorry to my friends in Nara, Japan!) and tasted just like beef. It was very impressive! Our third meal was at Victor’s Kitchen in Sunshine Plaza, where we enjoyed some dim sum dishes such as xiao long bao and siu mai. We also got to try some delicious speciality items, such as the Golden Egg Yolk Lava Bun and Golden Crispy Yam Bun. We made our way to a shopping area on Orchard Road, which had multiple shopping centers that were connected. I loved the "LOVE" sculpture and the gorgeous architecture of the shopping center! This was where we had our fourth meal, which was snacking in the food court at Ion Orchard. 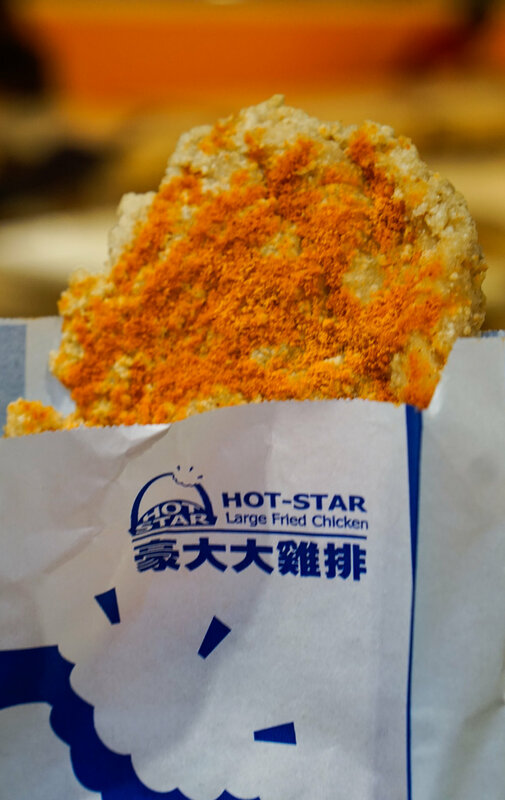 I was surprised to find here the famous Taiwanese franchise, Hot Star Fried Chicken! We enjoyed the savory and spicy chicken with some milk tea with golden bubbles from KOI Cafe. I will definitely keep an eye out if KOI Cafe ever opens one in the U.S.! After all the snacking, we headed up to our fifth meal destination, Paradise Dynasty, which served Michelin-star quality dumplings. We tasted the rainbow with 8 flavors (they must be eaten in this order too! ): Original, Ginseng, Foie Gras, Black Truffle, Cheesy, Crab Roe, Garlic, and Szechuan. I loved all of them but my favorite was Cheesy and Garlic! We took a break from the eating to visit Ion Sky, which was on Level 56 of the building, where we took in the views of the city. We could even see Malaysia from here! The sixth meal was at Soup Restaurant at a mall called VivoCity. What stood out for me was the Samsui Ginger Chicken! It was really delicious and very unique! We ended our meals of the day with some Blackball Taiwanese Dessert. They did not have many shaved ice versions of the desserts like in the U.S., but it pretty much tasted the same. We woke up to some rain, which I thought would help cool things down among all the humidity here, but it was still quite humid! We started out with some delicious and strong coffee, and we headed out to Zhong Yu Yuan Wei Wanton Mee, which sold wonton soup, as well as wonton noodles with pork! The meat is called “bu jian tian” char siu (the part of the pork that translates to the part that “never sees the sky”, AKA, pig armpit). It was so soft, tender and fatty! If I could, I would have sat there the whole day eating that stuff! Afterwards, we headed to Chinatown to 168 CMY Satay for some mutton and beef satay. We finished the meal with new favorite breakfast: kaya toast, milk tea and coffee. I completely fell in love with this kind of breakfast here, since I enjoy the strong coffee and the kaya toast, which is toast with kaya (coconut jam) and butter. We were surprised with a one-night stay at the famous Marina Bay Sands! It was a very unique and memorable part of this trip, as not many people can say they have ever stayed there. We left our luggage in the hotel and we explored the shops, the views, the outdoor swimming pool, the observation deck, and even 7 Eleven, where we snacked on some pandan rolls and Thai flavor Lays potato chips. In the late afternoon, we paid a visit to Gardens by the Bay to explore the Cloud Forest exhibit. It was breathtaking to see this greenhouse-like glass dome, with its indoor waterfall and vegetation. We were able to access the top of the “mountain” and descend to take in the sights and enjoy the cool, moist temperatures. It was truly a worthwhile experience this! Our day ended with a visit to Boon Tong Kee for Chinese food. I loved the fish filet, hainan chicken, and fried tofu! We then went to the Lau Pa Sat Festival Market for some beer, teh tarik (pulled tea, video below), bandung (rose syrup milk drink), satay, sting ray, and squid! It was pretty fun to experience a night market in Asia. It had been a long time since I last experienced it! This video portrays the “pulled tea”, called teh tarik, which is a hot Indian milk tea beverage. It tasted equivalent to chai tea, which I always enjoy ordering in the U.S.
Day 4 - Sentosa and more eats! We had a great stay at Marina Bay Sands. I woke up for the sunrise and the peaceful and beautiful views. Before we checked out, we went downstairs to try some nasi lemak at 1983 A Taste of Nanyang. The nasi lemak is characterized by fragrant coconut rice, and it paired so well with fried chicken and salted fish! We also enjoyed some more bandung here. I can never resist a pretty drink! After we checked out, we headed to Sentosa to explore and walk around. Sentosa was where a lot of main attractions were, such as Universal Studios, Dolphin Island, and S.E.A. Aquarium. We ran out of time to see any of the attractions, but I did a lot of window-shopping and browsing; we also enjoyed a Mango Peach Chiller from McDonald's and explored the Candylicious shop! Our next stop was another Michelin rated restaurant: Tai Hwa Pork Noodle. The pork noodle bowl (Bak Chor Mee) had minced pork, sliced pork, liver, meatballs, wontons, and salted fish. It was very delicious but it was a one time try for me, as it had too much going on; I guess I grew to appreciate the simpler dishes during my stay here. We stopped by Snip Avenue for a $4.80 haircut and then went to two more eating stops to finish up the evening. We got some awesome fish and chips take-out from Long John Silver’s, and roti prata from Ariff’s Restaurant. I chose the most unique looking roti prata, called the Cone Thosai. The curries that came with it were so savory! I am a big fan of curry and enjoyed trying authentic roti prata for the first time. We ended our last night in Singapore with a drive around the Singapore River, which included some great views such as the Cavenagh Bridge, the Fullerton Hotel, Marina Bay Sands, the Esplanade (the Durian buildings), the ArtScience Museum, the Merlion, and the Victoria Theatre and Concert Hall. I truly appreciated the architecture of the buildings here and admired the tremendous efforts Singapore has made into beautifying and maintaining these landmarks. It was a great way to end our visit to Singapore! Day 5 - Back to the U.S.! We got up early to go to the beautiful Sinapore Changi Airport, and grabbed some breakfast at Wang Cafe, which was perfect for our last meal in Singapore: coffee, kaya toast, and nasi lemak. We were supposed to fly from Singapore to Tokyo, then Tokyo to the U.S. Unfortunately the first flight got delayed by an hour, which affected the second flight. Japan Airlines happily booked us on a flight through Singapore Airlines so we could return home. I felt so fortunate to have an opportunity to fly through Singapore Airlines, since I have only heard great things about them! The plane was a double decker airbus, and it was also where I got to try my first Singapore Sling! Singapore was a very fun treasure hunt to try all the authentic Singapore food I wanted to try. The only thing I did not get to try was bak kut teh, but instant will do for now. Until next time! I look forward to coming back again in the next few years. Thanks for reading!